Mutation fights her way through the guards at Stronghold Penitentiary as she makes her escape attempt. One of the guards hides from the rampaging villainess before firing numerous tranquilizer darts at the inmate. Mutation shifts her form around the blasts prior to knocking out the last remaining guard. She then finally breaches the perimeter wall and reclaims her freedom. In the Chicago sewers, Flash Mercury does his best to comfort the distressed Malcolm about the transformation that has occurred within Dragon. He then explains how the Vicious Circle has changed into simply the Circle, an organization that has cast aside its criminal past to help with mutant rights. A seismic shift in the city above is experienced and Malcolm suspects that his father is fighting once again as someone has presumably crossed his path. Emperor Kurr opens fire with his weapon to shoot a hole through Super-X’s chest as he attacks those super-freaks transformed using his blood. He then shoots off Randy Ruthless’s head but as he takes aim at a fleeing LowBlow, Angel intervenes. She crushes her father’s gun which causes it to explode and earning her the wrath of Kurr. He is fully prepared to allow his daughter to share the fate of the villains he is targeting but another new arrival draws his attention. The engineer who built the original Dragon-Slayer is visited in his workshop by R. Richard Richards who has come to see him about purchasing a new robot. He is shown the newest Dragon-Slayer and is instantly impressed, agreeing to buy it…. A televised interview with Ronald Winston Urass is broadcasted where he is asked about his part in the recent battle between the two Dragons. He claims innocence of any wrongdoing, having simply helped Dark Dragon regain his freedom. Urass had no idea that Dragon had become a merciless killer and regrets that thousands of people perished during the recent battle. He finds it strange that Dragon has become a menace whilst OverLord is now engaging in discussions about mutant equality. 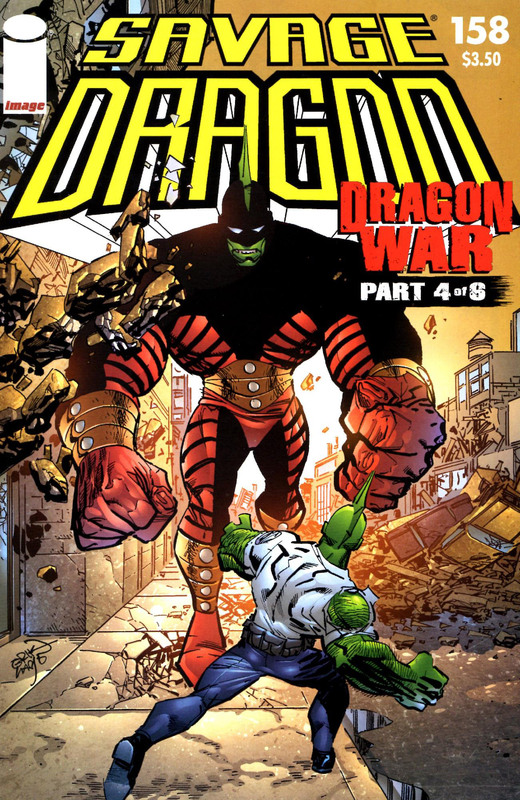 Brawn is the latest super-freak to be injected with Dragon’s blood and he moves to eliminate the Circle’s primary adversary. Flash Mercury leaps into action against Kurr but is quickly dismissed with a glancing blow. His mask is knocked loose which leaves him paralyzed, screaming for Malcolm’s assistance to retrieve the mask. Daredevil watches the chaos unfold but does not get directly involved. The fight continues and buildings begin to collapse which Flash Mercury and Malcolm just barely manage to avoid. Angel had still been weakened from the explosion of the gun she had destroyed and is unable to move away from the debris. Daredevil swings down into action to carry Angel away to relative safety. Kurr’s hand is grabbed by Brawn who crushes it until the power glove blows up, allowing the Circle member to gain the advantage. Kurr regains his composure and resumes fighting, watching on as his blood pours out through Brawn’s eyes as he had been too powerful for the blood to explode as it had done with other super-freaks. With his primary goal achieved, Kurr sees no point in continuing this duel. He vows to track down and eliminate the rest of the villains injected with his blood at a later date. Kurr then escapes using the teleportation device that he had stolen from Vanguard. The missiles strike at the base of Powerhouse and cause a great deal of damage to the alien structure. Ethrian is concerned that the energy he is receiving from Powerhouse is impeding its self-repair and transforms back into James Peterson. Charlie Hendrix approaches his friend, warning that the missile attack was merely the beginning of the assault. Chuk emerges from the shadows to grab a hold of his son, not even recognizing him at first. James explains to Chuk that the military had infected his son with the nanotechnology without his knowledge or consent. They then notice the wraiths that had roamed the fog and protected Powerhouse from intruders. The victims of the Hot Zone had become mindless protectors of Powerhouse and with the fog dissipating, the spirits have returning to the corpses, transforming them into zombies. These undead men and women close in on the tower and its occupants.